I see so many cars parked around a big corporate fast food place – so many queued up at the window, waiting for their flavorless extruded hunk of scientifically engineered food-like substance. So much substance with so little sustenance. Offset printed plastic focus-group tested graphics, tied in with billion-dollar commercial campaigns carefully crafted to make you jump at the sight of their logo like baby birds at a squirming worm. 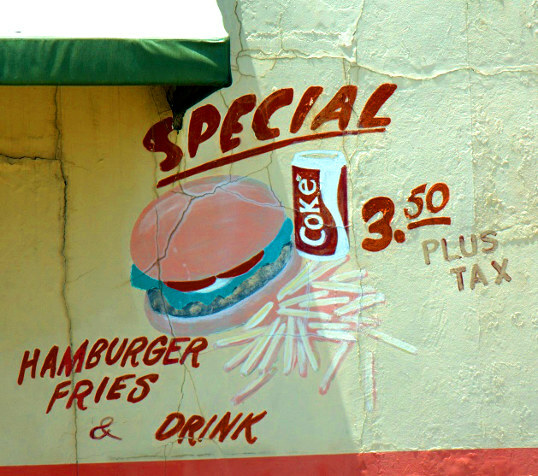 Meanwhile so many family owned greasy spoons go wanting with their hand-painted cracked stucco signs. The food might not be better, it might even be greasier, but at least it is real. This entry was posted in Photography and tagged Dallas, food, Texas. Bookmark the permalink.